Architect Patrick Hodgkinson envisaged the Brunswick Centre as a private mixed use development, at a time when such schemes were uncommon. Hodgkinson originally planned a much larger development between Russell Square and Euston Road but was frustrated by the Ministry of Defence, which owned the lease on a building occupied by the Territorial Army. The scheme was designed to replace run down terraces with low rise housing for 1286 people, with a ratio of 2:1 for the commercial sections of shops, offices, cinema, pubs, restaurants and underground car parking. Hodgkinson began work on the mixed-use ziggurat with his then boss Leslie Martin in 1959, but from 1963 was sole architect, employing a team which included David Levitt and David Bernstein. Two 17 storey tower blocks had been previously proposed for the site but Martin and Hodgkinson envisaged something quite different, scarcely higher than the surrounding Georgian terraces, with flats in twin A-shaped linear blocks facing across a raised public/retail plaza. Construction started in 1968 and when it was completed in 1972 it made headlines in the architectural press around the world, notwithstanding Hodgkinson’s dissatisfaction with compromises made by the builder and developer. Richard Rogers later called it one of the greatest modern buildings in Britain. 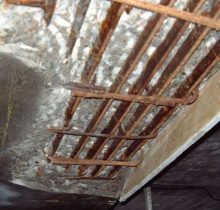 In the late 1990s Hodgkinson was invited back by developer Allied London to realise his original vision after the site had fallen into disrepair and retail occupancy was low, Hodgkinson worked with Levitt Bernstein Architects on a £20 million reconfiguration, which included painting the concrete, as originally planned by Patrick Hodgkinson and improving landscaping of the plaza. The much-praised revamp was completed in 2006 and Grade II listed status was granted when the restoration works were in progress. 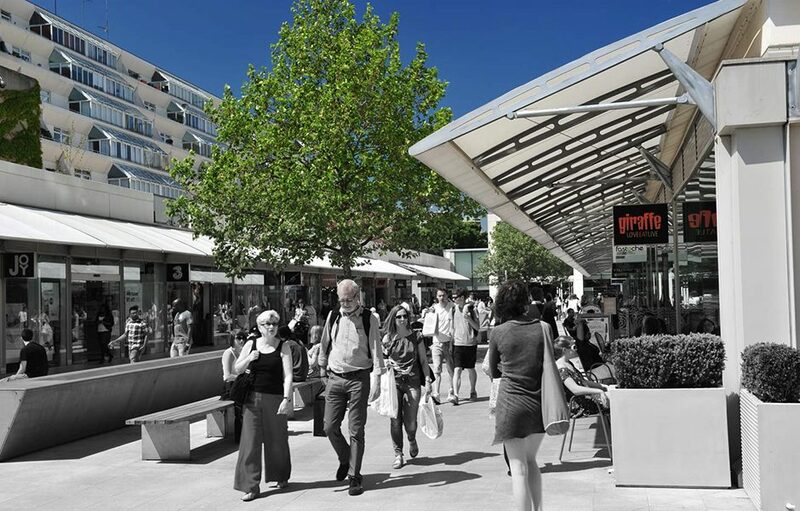 In Autumn 2014 Ronacrete was asked by M&J Group to propose screed materials for a re-waterproofing and re-paving project to the podium decks and plaza, to shorten the duration of the works by reducing the waiting time before paving could be laid; Ronafix polymer modified screed was proposed. Ronacrete was called to a site meeting in February 2017 to discuss detailing of Ronafix floating screeds laid to falls where the required balustrade heights on the podium decks restricted the minimum screed thickness. 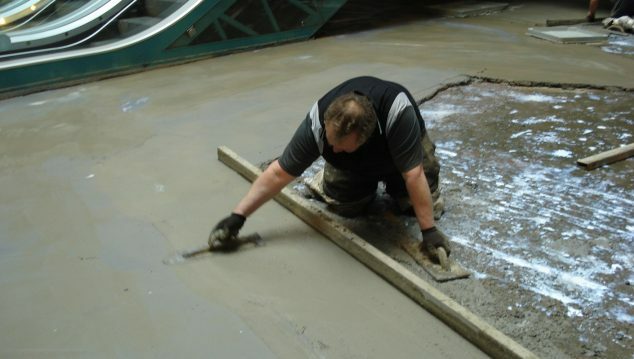 It was agreed that a minimum screed thickness of 35mm could be applied if plant and materials were only positioned on thicker sections of screed until after granite paving had been laid, to ensure that heavy point loads did not cause deformation of the insulation boards. 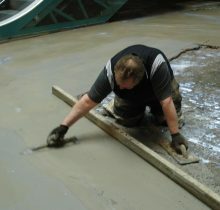 Ronafix Mix F polymer modified screed was specified for the minimum 35mm thickness floating screed and Ronafix Mix A was specified for bedding of the granite paving at a minimum thickness of 10mm, ensuring that additional deck construction thickness was kept to a minimum. Detailing of all screed related matters such as screed perimeters and joints were reviewed by Ronacrete and agreed before commencement of the works. It was agreed that given the importance of the site and the need for attention to detail required, Ronacrete would regularly attend site to maintain a watching brief and provide advice about developing issues. 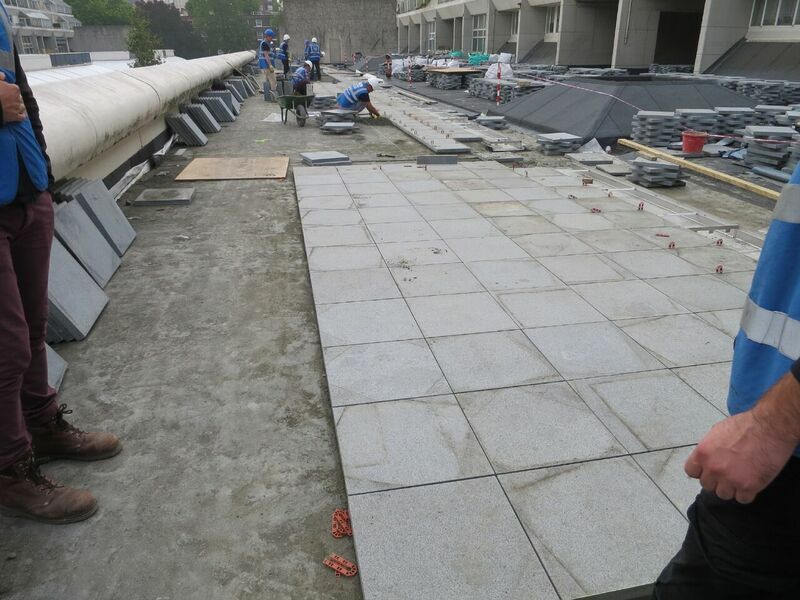 The contractor meticulously followed the advice provided by Ronacrete and the works to the podium decks and plaza were completed satisfactorily and in a timely manner. 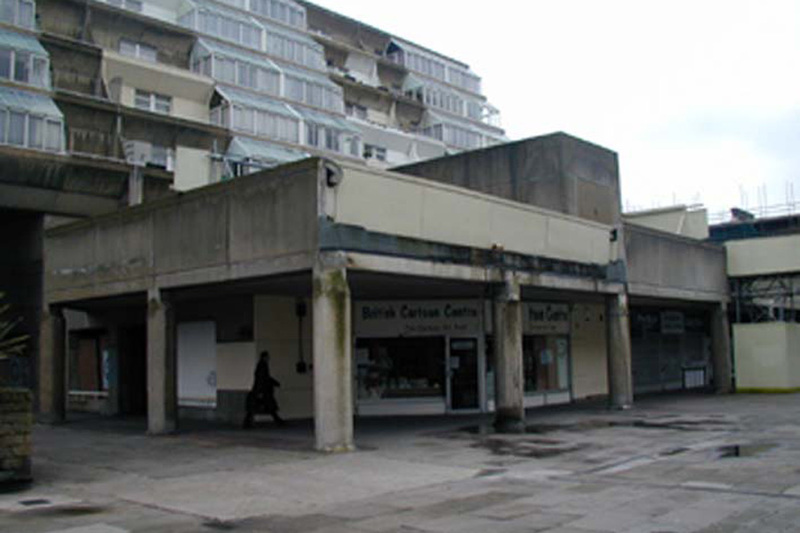 We at Ronacrete are very proud of our involvement in the works at the Brunswick Centre. For over 48 years, Ronacrete has been at the leading edge of product development and performance. Innovation and brand leadership are enhanced by technical support which is considered the best in the industry. Ronacrete provides a specialist range of products for installation by expert contractors. Technical advice is freely available (call 01279 638 700 or email technical@ronacrete.co.uk to ensure that the most appropriate product is selected. 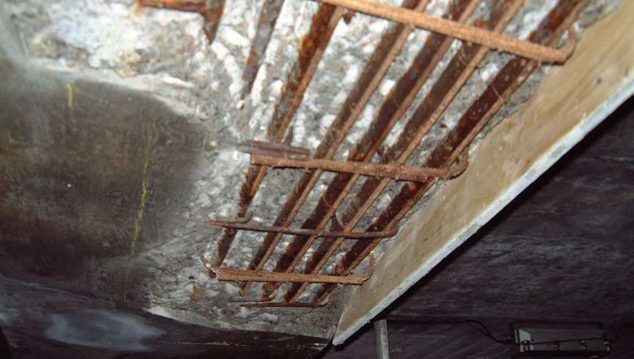 Products are widely specified and it is not uncommon for the Ronacrete team to be called in to provide the solution to a problem others cannot overcome. The product range includes resin bound and bonded surfacings, specialist screeding and floor coating products, concrete repair and protection materials, tanking and weatherproof renders and waterproof coatings. 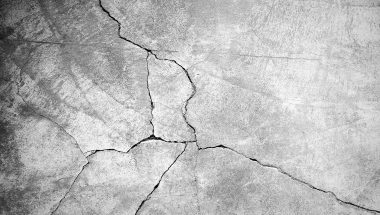 Ronacrete is a member of several trade bodies, including the Concrete Repair Association, The Concrete Society, FeRFA and BALI, to ensure that we remain fully engaged with other companies in our market sectors. To ensure that all our customers get the best possible service and highest quality product all of our materials are developed, manufactured and supplied in accordance with an independently audited Quality Management System to BS EN ISO 9001:2008. We also work to a strict Environmental Management System to BS EN ISO 14001:2004 and a Health and Safety Management System to OHSAS 18001:2007. NQA (UKAS accredited body) regularly audits all management systems. In addition to this the company is proud to have received the Queen’s Award for Export Achievement. The Ronacrete philosophy is to constantly strive to be the best in all activities. We are one of the few successful family run independent British companies in the building materials industry and we are proud of our flexible attitude and genuine commitment to customer service.